Black Widow will have her history fleshed out in both Captain America: The Winter Soldier and The Avengers: Age of Ultron before she stars in her own film. Marvel revealed the studio will further explore Black Widow's character in her own film after The Avengers: Age of Ultron. Played by Scarlett Johansson, Black Widow is one of the leads of the upcoming film Captain America: The Winter Soldier, and her arc revolves around her history as a spy. "We start filming the next Avengers film at the end of March," Kevin Feige, Marvel Studios president, said. "[Black] Widow's part in that is very big. We learn more about her past and learn more about where she came from and how she became in that film. The notion of exploring that even further in her own film would be great, and we have some development work with that." Marvel has not explained what stage of development work this is, but at the moment it probably means Marvel Studios is brainstorming where to go from The Age of Ultron for Black Widow. On Black Widow's role in The Winter Soldier, co-star Chris Evans said her arc "is coming to terms with her history - she's been a spy, and spies aren't necessarily trustworthy." 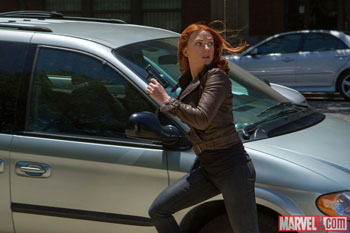 Black Widow didn't have a strong debut in Iron Man 2, but she was influential to The Avengers. After showing plenty of promise in movies without her name attached to them, it would be great to see her in a movie all about her.